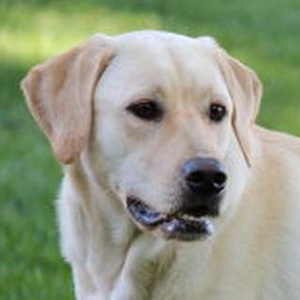 Dagny is an extremely mellow yellow Labrador. Although she’s 60 pounds, she is very loving and gentle – and gives a big dog smile to people she meets! Dagny loves being around people – especially children. She’s a R.E.A.D. (Reading Education Assistance Dogs) member and enjoys being read to by children on her favorite blanket. René says Dagny is a “pawfect” listener! René and Dagny also visit as a North Star Therapy Animals team at the Ronald McDonald House, local libraries, Children’s Hospitals and Clinics of Minnesota, and stress relieving events at area colleges. When she’s not volunteering, Dagny loves to chase deer, wild turkeys, and squirrels that venture into her yard. She also enjoys swimming with René’s grandchildren in the pool and going for long walks.